The Bridge Watch Rating is great way for harbour, hobby or tall ship mariners to familiarize themselves with the Transport Canada examination system. The Bridge Watch Rating exam is, with some study, an achievable certificate for persons of any skill level. Every deck watch on large commercial vessels requires at least two members. The first being the “OOW” or “Officer of the Watch”. The second member of the watch must be a “Bridge Watch Rating” which certifies the individual as someone who is certified to stand as look-out and whom can serve on the helm during the watch. The licence has gained more importance as shipping companies have reduced their crews. If STCW BASIC SAFETY and STCW SURVIVAL CRAFT have become the bare minimum for getting hired aboard commercial freighters, then BWR has become the silver bullet that puts one above crowd (or at least above the biggest crowd and into a smaller more elite crowd). For good order’s sake, there is only a written exam for this certificate (no oral examination). I literally just copied and pasted Rhys’s description of this book from the NS 1 exam guide for the following good reason. Since a Bridge Watch Rating is first and foremost a look-out/ second pair of eyes for the OOW, it stands to reason that they should know the “Rules of the Road” as well as the OOW. 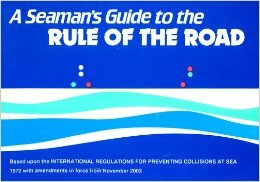 A Seaman’s Guide to the Rule of the Road–Recognizing what’s good for the goose is good for the gander, I have also included this old standby. Keep in mind that the “Canadian Modifications” are not included in “Seaman’s”. Pick the Canadian Modifications up here and add them t0 the material in this text. The Boatswain’s Manual–This book will cover the rudimentary rope work that is expected of a BWR as well as including the look-out bell signals, cargo lifting arrangements, life-saving appliance knowledge asked by the exam. American Merchant Seaman’s Manual–An American publication which is dedicated to the training of ABs for service in the American Merchant Marine. It includes much of the same cordage, tackle, signal information and lifeboat information included in The Boatswain’s Manual but also has a section which includes the collision regulations. The downside is that, being an American publication, this book may not have information on a couple outlying exam questions and is therefore only “good enough”. However, it also includes a section on the Collision Regulations. This makes it the cheapest option for the thrifty candidate if paired with the Canadian Modifications to the Colregs because it can stand as study guide for both parts of the exam.